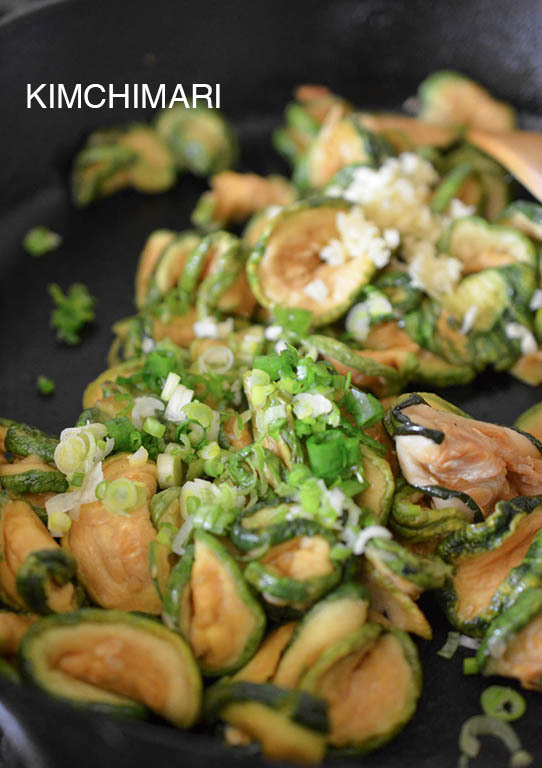 Hobak Jeon (Pan-fried Zucchini) all stacked up! So, I decided to dry them – just like how my mom’s generation used to do. With Koreans, when you have too much of something, you dry them. Especially in the old days, Koreans were masters of drying produce: dried mushrooms (shitake, woodear, etc), dried bracken fiddleheads(고사리 gosari), dried bellflower roots(도라지 doraji), dried eggplant(가지 gaji), dried radish greens(시래기 shiraegi), dried radish (무말랭이 moo malaengyi), dried seaweed (김 gim) and then not just vegetables, Koreans made dried squid, dried fish, dried mussels,..I mean, I can go on forever..In the age before refrigerators and freezers, before green houses, Koreans collected and dried vegetables in the summer/fall and enjoyed them in all thru winter and into early spring. Koreans even have a traditional holiday called 정월대보름(Jeongwol Daeboreum) which is celebrated on the first full moon of the first month of the lunar year. This year it will be 2/22/2016. 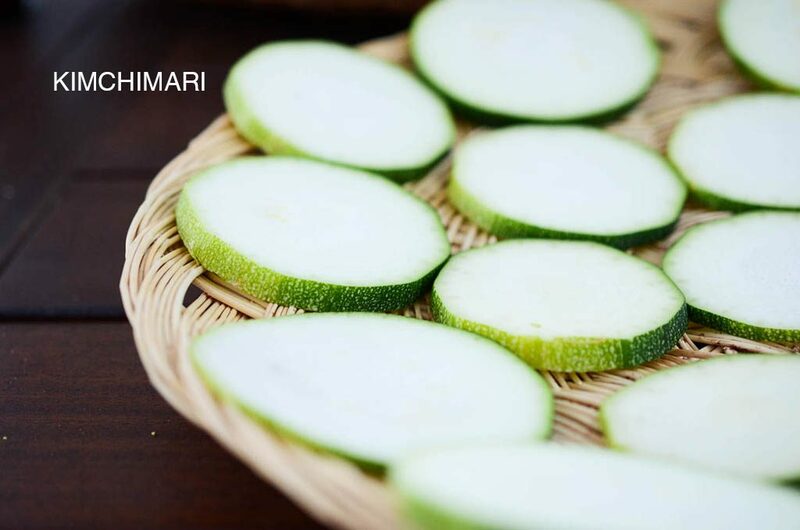 On this day, among many things, our ancestors cooked 5 grain rice(오곡밥 Ohkokbap) and many namul dishes made from dried vegetables including dried zucchini namul. I wonder if it was also a way to make sure people got good nutrition during the long winter months. I will talk more about it later and perhaps dedicate a post on the traditional Daeboreum menu. So, as you may know from cooking with dried mushrooms, drying vegetables transforms the texture and flavor completely. 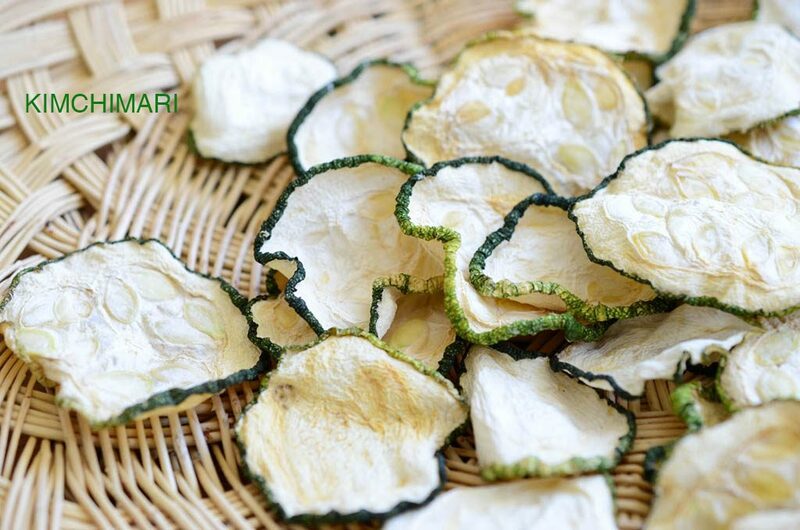 The flavor of dried vegetables is usually much more intense and the texture is often more chewy. And if you know me, you know that I don’t really like mushy texture very much. In fact, I am not sure if I mentioned this before (hmm..maybe I’ve been blogging too many years…or maybe, just maybe, I’m getting a little old, haha) but unlike many Koreans, I am NOT a huge fan of raw fish or sashimi. When I eat raw fish, the mushy texture just prevents me from enjoying the flavor. I just want the thing one from my mouth – either back out or just by simply gulping it down…I know I’m strange.. 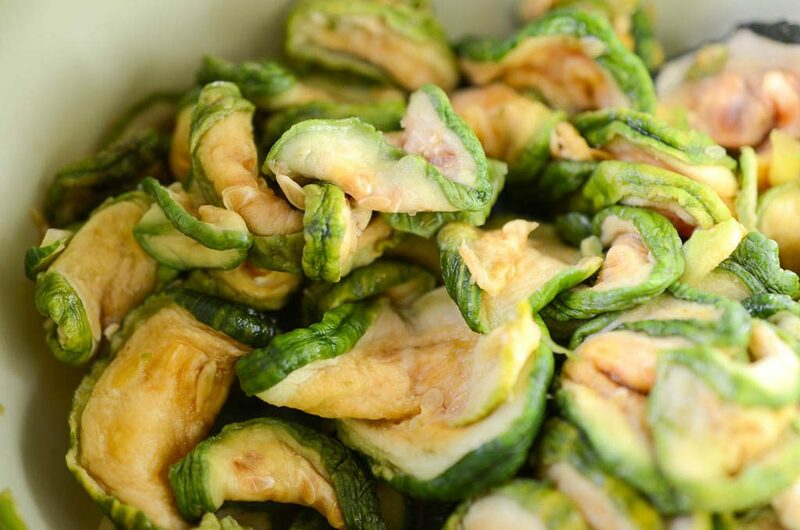 Dried vegetables also have better nutrition – much higher in vitamin D! 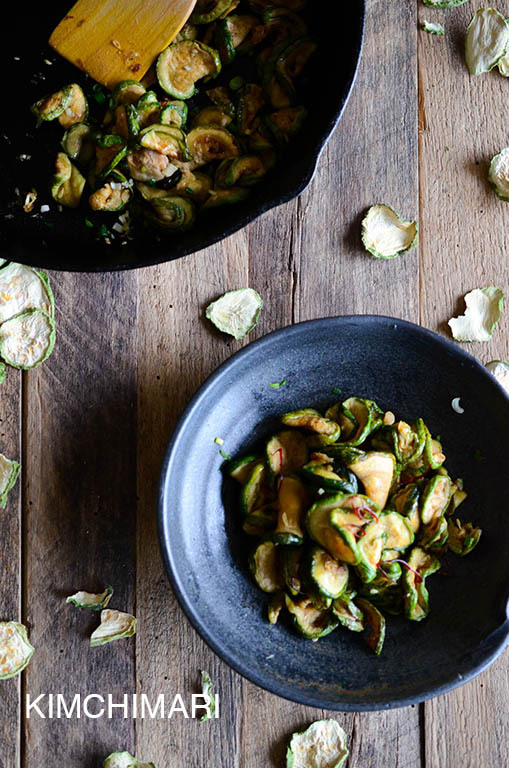 Going back to Zucchini – so last summer, I sliced my zucchini and let it dry in the sun for a couple days. Since California is SOO dry in the summer, a couple days is all I needed. 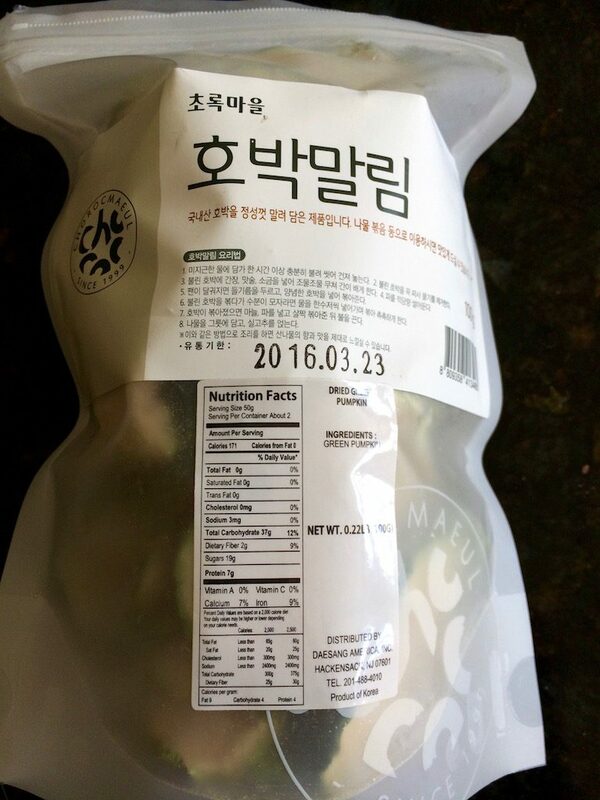 FYI- Choroc Maeul(초록마을) is a big food brand name+franchise in Korea that sells mostly organic or high quality Korean groceries. Great. Let’s get cooking, shall we? 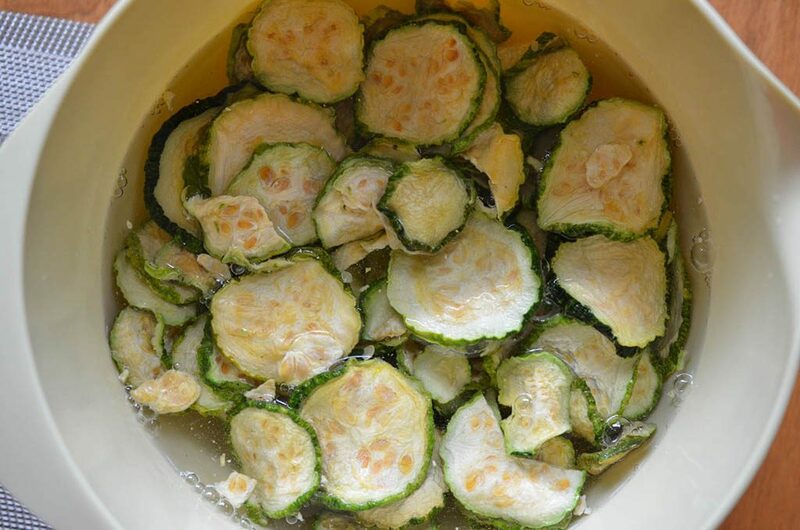 Strain zucchini slices and discard the water. 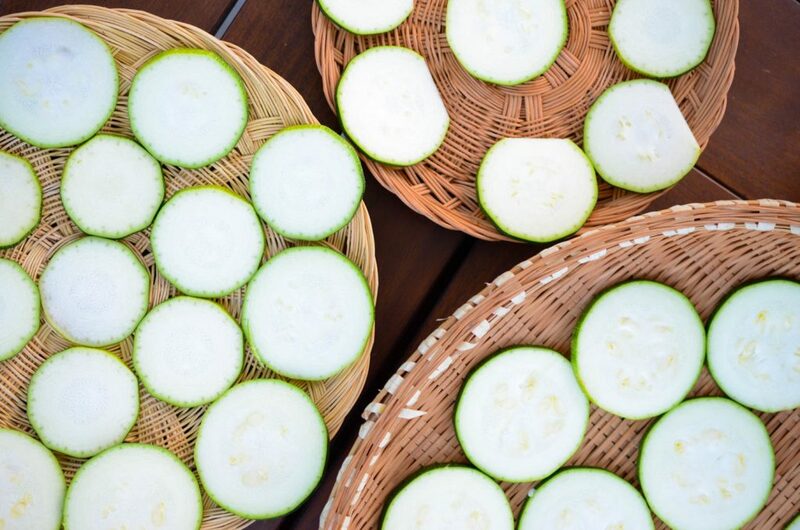 Squeeze excess water from zucchini by squeezing them gently with your hands. Do not squeeze too much but just enough so that water is not dripping from them. Saute for another 3-4 min. 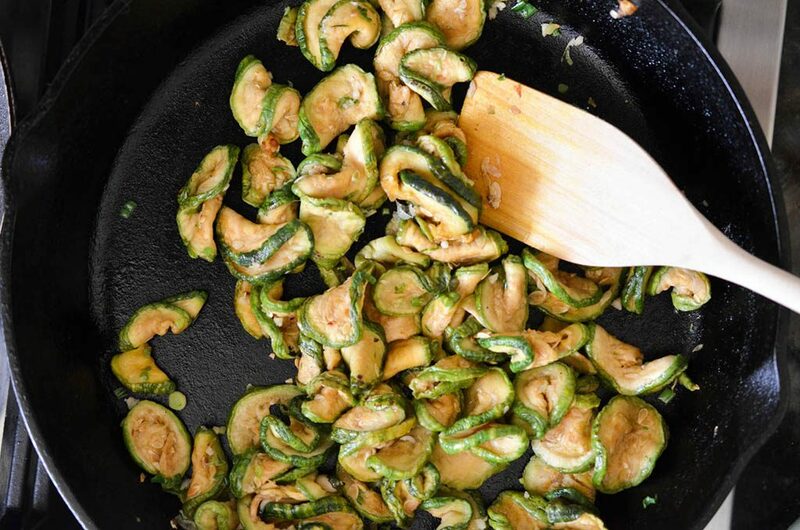 until zucchini slices are tender and seasoned. You can also brown it a little by sauteeing on med high heat. Add more 1~2 Tbs more water if you want more softer, more moist namul. Up to you. 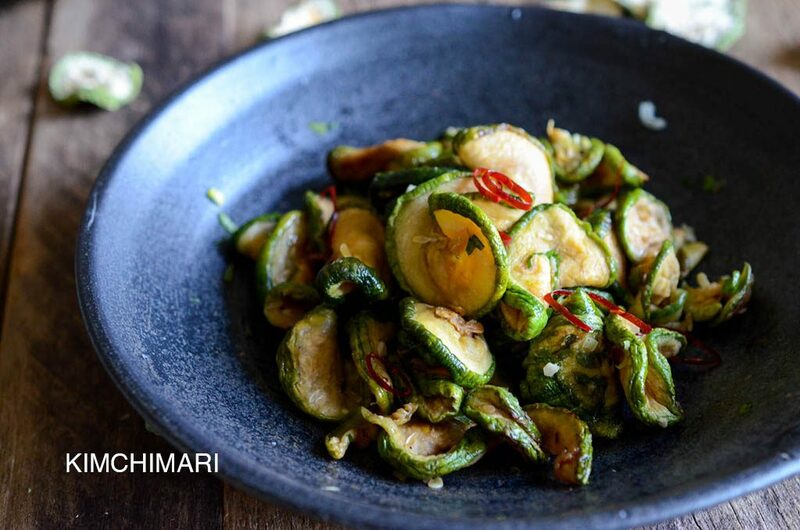 Enjoy your Korean dried zucchini side dish warm or at room temperature. Can store in fridge for few days and reheat in pan or quickly in microwave. 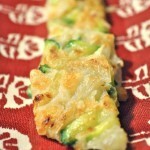 Great addition to Bibimbap or Fried Rice. In fact, I recently made Kimchi fried rice with leftover hobak namul and it was great! It added a great chewy texture to the fried rice. 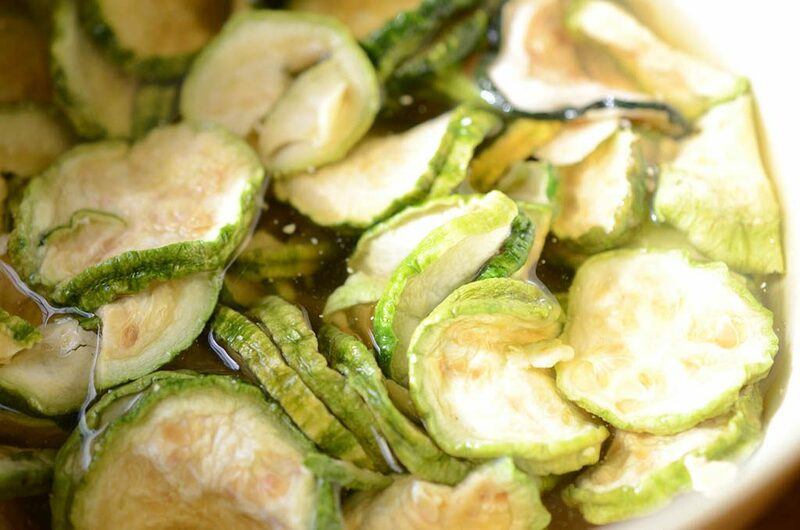 Also try adding soaked dried zucchini to your Deonjang Jjigae. It’ll be a treat!! 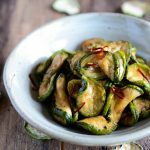 If you have a dehydrator, you can dry your own zucchini slices now and enjoy it sooner than later. 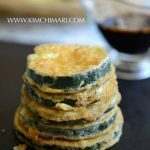 I found a great Italian dried zucchini recipe that talks about using the dehydrator to dry zucchini. 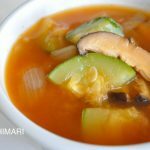 ENJOY your Hobak Namul and vitamin D! yum; can’t wait to make this! I have everything except the dried squash… which I will make soon! it’s hot here in Texas. my Korean squash is coming in… soon!